In this case, the couple got married in August 2010. Surprisingly enough, the husband moved out in October 2010. In March 2011, the wife filed for legal separation. In February 2012, the court entered a default judgment of legal separation. Under the judgment, the husband was required to pay the wife $1,250 in monthly spousal support and to continue to provide her (and her daughter) with health insurance. While the couple reconciled in September 2012, the wife decided to end the marriage in April 2013. In June 2013, the husband sought to modify spousal support, requesting that it terminate at the end of that year. At the hearing, both parties testified that neither of them intended to end their marriage at least until April 2013. The court concluded that the judgment of legal separation was “not definitive” as far as deciding the date of separation. The court pointed to the “unusual” nature of the relationship and the circumstances surrounding the marriage. The court found that the marriage lasted for two years and eight months (from August 2010 through April 2013) and ordered the husband to pay $2,750 in monthly spousal support (through August 2, 2014) based in part on the length of the marriage. The husband appealed. The court of appeals reversed, finding that a judgment of legal separation is “res judicata” on the issue of the date of separation. Therefore, the lower court lacked the discretion to find that the date of separation occurred on any other date after the judgment was entered. If the husband wanted to modify the support order, he would have to provide a showing of “changed circumstances” in accordance with California law. This case is a good example of the challenges parties often face when considering a divorce or legal separation. While it is an unpublished opinion, the court’s reasoning may serve to inform future cases in this jurisdiction. Issues pertaining to legal separation and divorce require strict attention to detail and the applicable law. If you are considering divorce, you are encouraged to contact a local, experienced family law attorney. 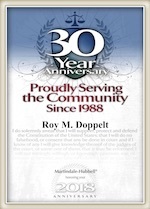 Roy M. Doppelt is a family law attorney representing spouses and ex-spouses for more than 20 years in Southern California. Our office serves clients throughout Southern California. For a free consultation with a dedicated and experienced family lawyer, contact Doppelt and Forney, APLC through the law firm’s website or give us a call toll-free at (800) ROY IS IT (769-4748).